This is the best vegan mac and cheese you will ever eat! Rich and creamy, cheesy and stretchy, made without nuts, dairy, gluten, or soy. 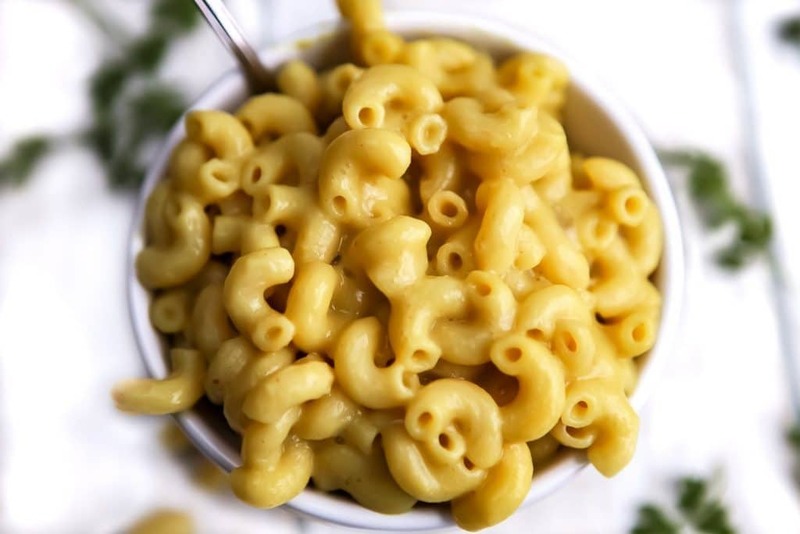 Kids and adults alike will LOVE this mac and cheese and may never even guess that it’s vegan! Make it quick and easy on the stovetop or bake it for extra cozy comfort food! Gluten free, nut free, and dairy free! Easy to make in just a few minutes! Everyone I know loves a classic bowl of mac and cheese! This vegan version is surprisingly similar to the real deal and even non-vegans with love it! I’ve been tweaking and perfecting this vegan mac and cheese recipe for about 19 years now. I’ve adapted it from a recipe in an old school vegan cookbook called “The New Farm Vegetarian Cookbook.” (It was my vegan bible years ago before blogs and online recipes were a thing). Pasta – Macaroni, shells, or any small pasta shape works great. Use gluten-free pasta if need too. Plant-Based Milk – Any PLAIN flavored plant milk like soy milk, almond milk or oat milk, will work great in this recipe. 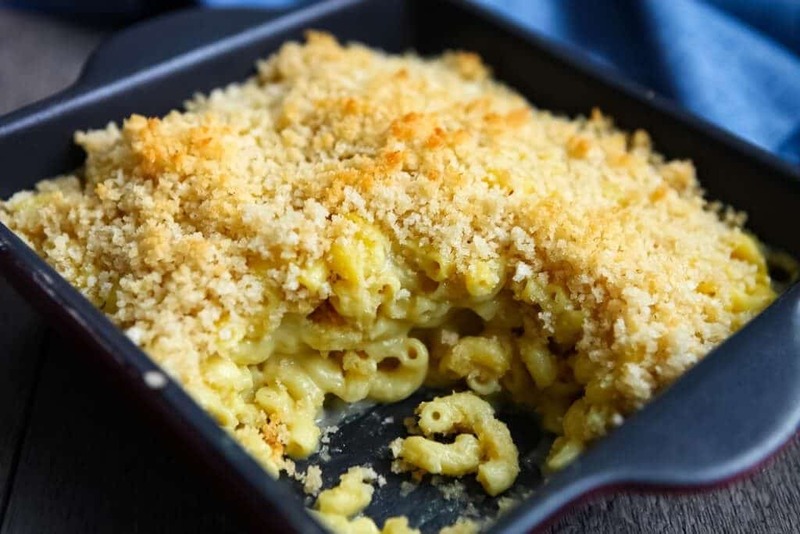 For an extra rich and creamy mac and cheese, you can also use 1 1/2 cups of canned coconut milk or cashew cream plus 1/2 cup water in place of the 2 cups of milk. Nutritional Yeast – Aka nooch. This is a yellow powder found in most health food stores. It has a cheesy umami flavor and without it, your vegan mac and cheese just won’t be cheesy tasting. You can learn more about nutritional yeast here. Tapioca Starch – Aka tapioca flour. This is essential for a creamy, stretchy texture that won’t get gloppy once it cools off. You can sub it with corn starch or potato starch, but nothing else gives your cheese sauce the same great texture as tapioca starch. Corn Starch – This helps to thicken up your sauce and make it the right consistency. (You can swap potato starch for this equally if you prefer). Turmeric – Just a dash for color. Oil – To give it a richer flavor (Optional). Refined coconut oil, vegan margarine, or my vegan butter recipe all work great in this mac and cheese. Miso or Tahini – (optional) For a cheesy bite. If you want your mac and cheese to have more or a cheddar taste, add 1 tsp of white miso paste or tahini to your cheese sauce. Pot – To boil the macaroni or pasta. 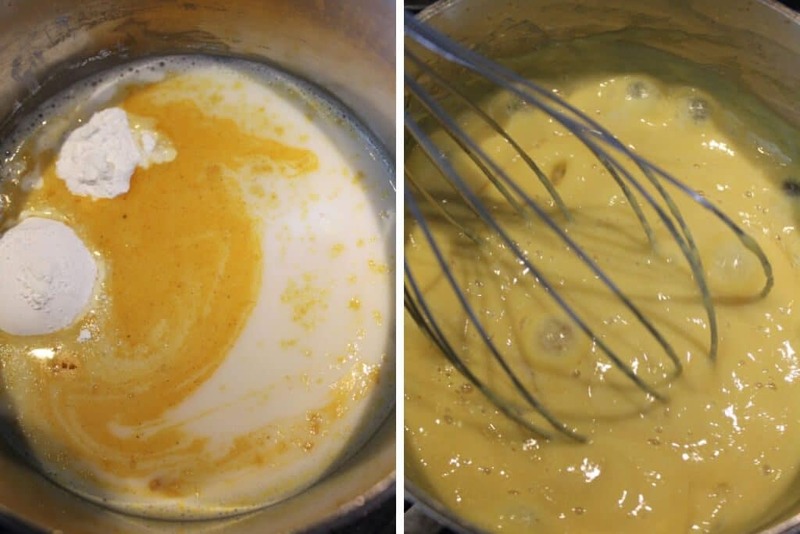 Whisk – To stir your vegan cheese sauce into a creamy masterpiece! Boil pasta of choice according to package directions. Put all the cheese sauce ingredients to a saucepan. (Plant-based milk, nutritional yeast, tapioca starch, corn starch, salt). Turn on heat to medium low stirring frequently until it boils, then stir constantly for about 30 seconds. Drain and rinse the cooked pasta and mix it in with the vegan cheese sauce. (Cook it al dente if you are going to make baked mac and cheese). Stir well and serve hot. 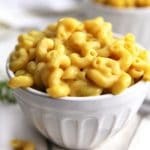 How do I make baked vegan mac and cheese? Follow the steps above then add an additional 1/4 cup of water to the stovetop mac and cheese. (To account for evaporation in the oven). Pour the mac and cheese into a lightly greased casserole dish. Top with panko breadcrumbs, or crumbled vegan crackers mixed with melted vegan margarine and 1/4 tsp garlic salt or simply top with shredded vegan cheese. Bake at 350° F for 20 minutes until it starts to bubble and the breadcrumbs have turned slightly golden. Make sure to use plain plant-based milk. Vanilla flavored milk will ruin your dish. Don’t turn on the heat until you have mixed the dry ingredients with the milk. (It will get lumpy if you add starch to warm liquid). Stir your cheese sauce frequently. It will firm up quickly once it reaches a certain temperature and goes from a runny liquid to a thick sauce in just a few seconds. How can I make this vegan mac and cheese healthier? You can add 1/2 cup of boiled and pureed carrots, squash, or sweet potatoes to the cheese sauce for extra hidden nutrients. Macaroni and cheese is also delicious with added steamed broccoli, peas or kale. If you want this mac and cheese to be fat-free, simply leave out the oil or margarine. It is not essential in this recipe. I hope you enjoy this family favorite for years to come! If you like cheesy vegan comfort foods, be sure to check out my Alfredo Sauce with Coconut Milk, Vegan Nacho Cheese Sauce – Cheddar Style, or let me show you how to make vegan cheese from scratch. (It’s easier than you think)! 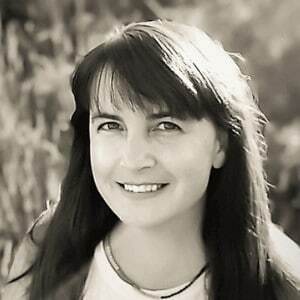 Don’t forget to Follow Me on Pinterest for more family-friendly gluten-free/ vegan comfort foods! 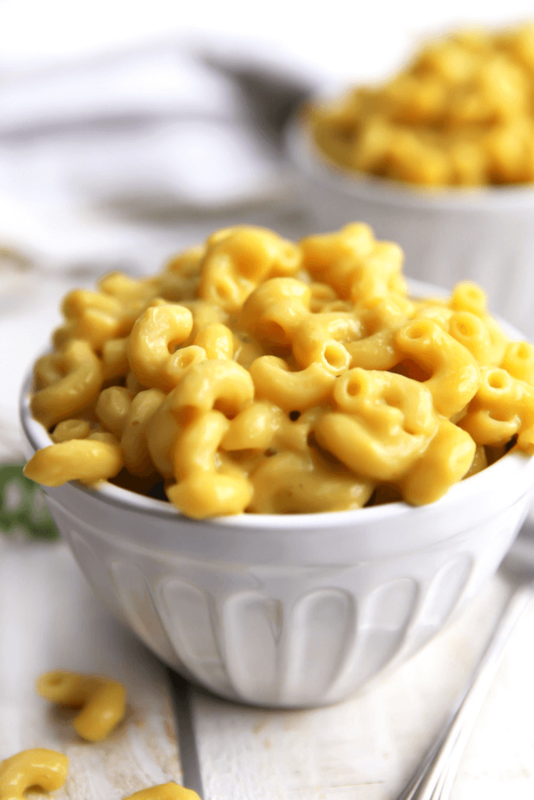 The best vegan mac and cheese recipe made without gluten, dairy or nuts! 8 oz macaroni pasta or any other small sized pasta (Use gluten free if desired). Add all the cheese sauce ingredient to a saucepan. (Plant-based milk, nutritional yeast, tapioca starch, corn starch, salt). Melt 3 tbsp of vegan butter in a small bowl and add the breadcrumbs and garlic salt to it and stir well. Top with panko breadcrumb mixture or simply top with shredded vegan cheese. Don't turn on the heat until you have mixed the dry ingredients with the milk. (It will get lumpy if you add starch to warm liquid). This macaroni and cheese is also delicious with added steamed broccoli, peas or kale. If you want this mac and cheese to be oil-free, simply leave out the oil or margarine. It is not essential in this recipe. 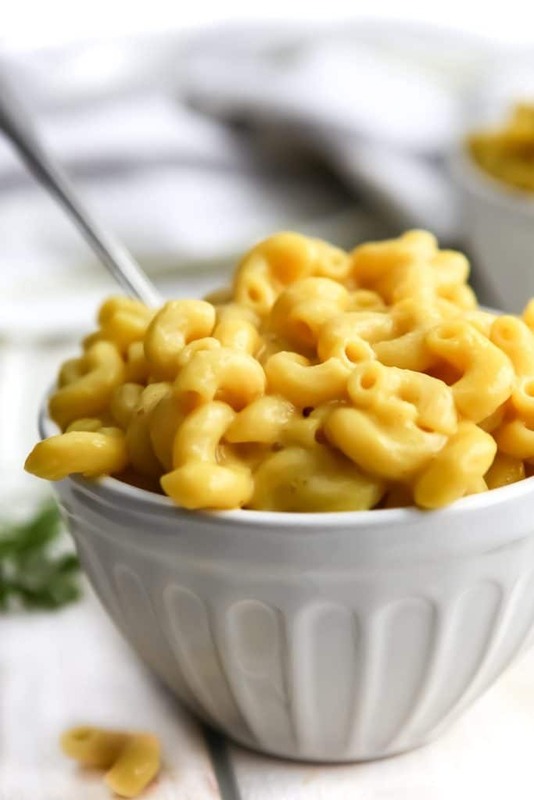 * For an extra rich and creamy mac and cheese, you can also use 1 1/2 cups of canned coconut milk or cashew cream plus 1/2 cup water in place of the milk. Finally a vegan recipe with no tofu, soaked cashews or nuts, carrots and potatoes required. This really reminded me of how macaroni and cheese is supposed to taste like: rich, creamy and satisfying. This really is the BEST vegan mac and cheese! I have tried so many other recipes but this one is a keeper! My boyfriend usually rolls his eyes when I say I’m making mac and cheese, but he said this is the best one I’ve made so far! Love this recipe! Made it last night and we chowed it down. Thanks for making these recipes so simple, easy to follow and best of all….delicious! Thanks Jessica! So happy that you liked it! This is a recipe that many people would be waiting for, as a lot of people follow vegan diet. I love mac and cheese, and love it more topped with ketchup. Can a lactose intolerant person eat this mac and cheese? Or does it need to be amended for him or her?